Acerservicecenter.in historical owner info, name servers, Analytics ID, Adsense ID, Addthis ID, advertisers, screenshots, meta tags, whois, site and server info. 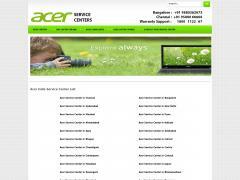 List of Acer service center Phone numbers in India, Acer service centre addresses in India and dealers of Acer authorized service centers in India. Sites related to Acerservicecenter.in based on metadata.